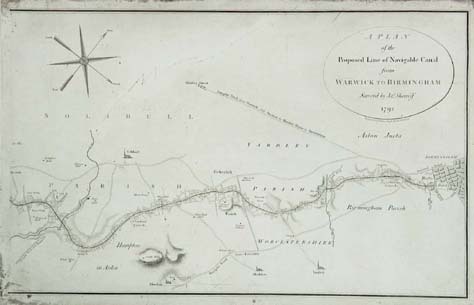 A Plan of the Proposed Line of the Navigable Canal from Warwick to Birmingham. The plate is typical of the finely engraved maps of the period. Some of the hachuring is hardly visible on the plate, nothing more than a finger print. Each of the plots of land through which the canal is routed is given a number, which was keyed to a separate list of owners' names. Notice the depth of the incision which printed the border and the canal. You can see that the deeper the incision, the blacker the line is on the paper. This is one of the most simple types of engraving, but there are features which are worthy of note. 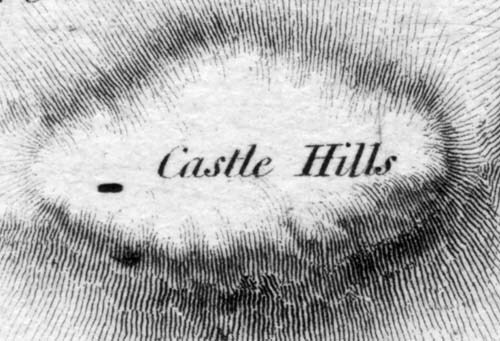 Look at the oval surround of the title; there is no trace of where the engraver started or stopped, even though the engraver varied the width of the border. Notice, too, the way the compass is engraved, using simple shading to make it appear three dimensional. To the right of the compass can be seen a bad scratch, looking like wilful damage. In fact, if was probably caused by nothing more sinister than a small piece of grit which rubbed into the copper when the plates were carelessly stored together, an indication of the softness of the copper and how easily damage could occur.